Lighthouse Marina Resort the new resort making headlines. Lighthouse Marina Resort, why all the fuss? I have not been to the Lighthouse Marina Resort in Subic Bay . So many people I have talked to about the Lighthouse Marina Resort raves about it and when I say rave, I mean rave, I cannot shut them up. So I cannot wait to go and see what all the commotion is about. From what I have been told the Lighthouse Marina Resort is a new luxury boutique resort, with a small number of rooms and a huge emphasis on service. Now this could eventually diminish as the honeymoon period of the resort wears off, but only time will tell. Where is Lighthouse Marina Resort Subic Bay? 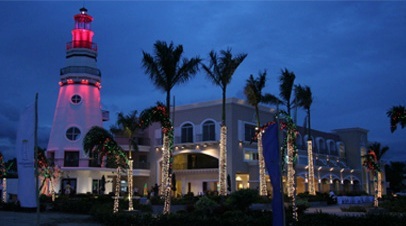 The Lighthouse Marina resort is in the Subic Bay Freeport Zone, which is just outside of Olongapo. If you are traveling from Manila it will take you between 2 - 3 hours, depending on traffic and which day it is. Both Saulog Transit and Victory Liner buses service the Manila to Olongapo route, both buses are air-conditioned. From Olongapo you can easily catch either a taxi or a jeepney to the Subic Bay Freeport Zone and onwards to the Lighthouse Marina Resort. An alternative to the road trip from Manila is to catch a ferry from the CCP center to Orion in Bataan. From Orion you can easily catch a bus to Olongapo or arrange for private transport to pick you up and drop you at the Lighthouse Marina Resort, this is the easiest way. From what I can gather the rooms are pretty impressive, quite large and with a very desirable bath! Each room, pardon me, each Aqua Room, Suites and Spa Suites have a 42" plasma TV mounted on the wall, so it is like having your own theatre in your room. The Aqua Rooms that face onto Subic Bay have a verandah where you can watch the spectacular Subic Bay sunset. By the sound of it you do not need to leave your room once you have arrived, but if you do that you will miss out on a lot of what Subic Bay has to offer. There is also a restaurant downstairs, The Sands, which overlooks the swimming pool. All you need to do is put the dates in the search box below, that your looking to stay in Subic Bay. The search box will search for the best prices of hotels in Subic. If you have been to the Lighthouse Marina Resort let me know what you think of it, you can contact me here. Let me know if it lived up to your expectation and whether you would go back, oh and don't forget to send some photos. One other thing, the Lighthouse Marina Resort is so popular that it is often booked out weeks in advance, make sure you book early. Note: Photos care of Lighthouse Marina Resort Subic Bay. If you would like more information on the Lighthouse Marina Resort Subic Bay, just fill out the form below. What Do You Think About Subic Bay?